Today, with my in-laws, we decided to try out a new diner (well, it’s not “new,” per se, but new to us) in Ann Arbor near campus called Benny’s Family Dining. 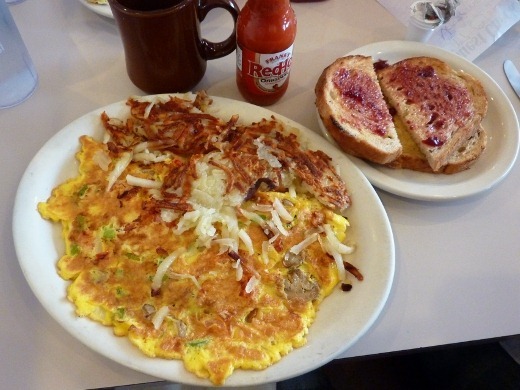 It was your pretty standard diner fare, and I ordered the Vegetarian Omelet which contained mushrooms, tomatoes, green pepper, onion, and Swiss cheese. The middle part of my omelet was delicious, with lots of super-melty Swiss cheese dripping out of the center. The edges of the omelet were a tad overcooked, but saved by a few dashes of Frank’s. The hash browns were nice and crisp on top, which I like. Seeded rye toast was an available item that made me happy! Caraway-seeded rye toast always wins points in my book, as I’ve blogged about in the past. Nice and buttery, too. Coffee was good, another vital diner necessity, along with frequent refills from the attentive wait staff. All in all breakfast was good, and I could see myself going back to Benny’s for an inexpensive big breakfast again.